Manchester City extend winning streak – Kenyatta University TV (KUTV). All Rights Reserved. 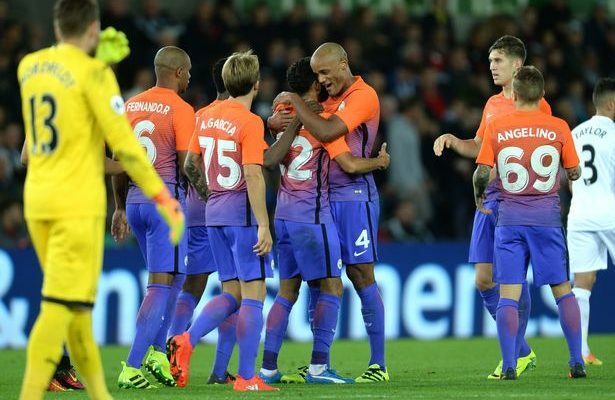 Pep Guardiola’s boys yesterday showed another class during the EFL cup game when Manchester City thumped Swansea City 2-1 to qualify for the fourth round. Gael Clichy’s fourth goal in English football had put City in charge before Aleix Garcia swept home a second. Swansea’s record signing Borja Baston missed several chances before Gylfi Sigurdsson scored a late consolation. Belgian centre-back Kompany sat out Euro 2016 and had not played since injury forced him off in City’s Champions League semi-final defeat by Real Madrid on 4 May. City have lost just one of their last 12 matches against the Swans in all competitions so will fancy their chances at the Liberty Stadium. “It is not a good moment for us. Little things are going against us, we are missing chances. “Manchester City are a very good team, even though they changed their players around. But I am optimistic, as I saw my team play a good game. Speaking after the match, Gael Clichy said the win was the most important thing. The victory is the most important thing though because if you lose you are out of the competition so now we can rest and look forward to Saturday,” Gael said. It just happens sometimes there is a moment in the game where the game changes a little bit. The first half wasn’t good enough but in the second half we came back with more desire so we have to keep playing like this. It was a good night for everybody including the young players and everyone is happy now.